The scenario is one with which you may be familiar: you discover a webcomic that's new to you but has been around for a while, and decide that you've gotta read the whole series from the start. (Okay, you're only familiar with this if you're a huge nerd like me.) But webcomics are addictive, and you risk your whole day if you allow yourself to sit and click "next" ad infinitum. 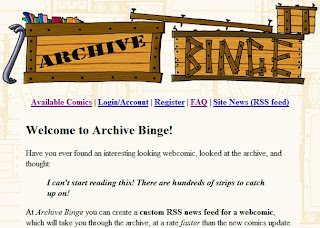 Archive Binge exists for exactly this situation, solving the problem by creating a custom RSS feed (remember I said you need to be a nerd) that will gradually get you caught up. The site's design is, ironically or not, mired in the late 1990's - but it looks like it gets the job done. Your employer will thank you.